The success of your small business depends on the satisfaction of current customers, and your ability to generate new ones. In today's competitive business environment, that means you need to know not only who your customers are, but also every interaction they've had with your company. Imagine, for example, you have an ecommerce business. A customer calls to complain that there were mistakes with his order. Your customer service agent does a good job handling the customer's complaint, and you think you've done a good job keeping that customer satisfied. But what if this is the third complaint from the same customer in the past 2 months? If your agent knew that, would he have handled the call differently? Would he, for example, have offered your customer a discount on his next purchase, or apologized that it's taken so long to resolve his problem? "C-R-M stands for Customer Relationship Management. What is CRM? At its simplest definition, a CRM system allows businesses to manage business relationships and the data and information associated with them. With CRM, you can store customer and prospect contact information, accounts, leads, and sales opportunities in one central location, ideally in the cloud so the information is accessible by many, in real time." How Specifically Will CRM Help My Business? You'll streamline customer interactions: using CRM software, you'll more effectively manage customer contacts, set appointment, monitor the effectiveness of marketing campaigns and handle customer service. You'll be able to view all important business metrics on an easy-to-understand and clearly-organized dashboard. You'll meet important deadlines: with all your data in a single location, you can more effectively schedule appointments, monitor progress on important projects and automate critical reminders. For example, your sales reps could automatically receive reminder emails about scheduled sales calls. You'll manage your sales reps more efficiently: your sales managers will be able to all the important metrics regarding the progress sales reps are making. For example, they'll be able to see for each sales rep sales statistics, lead contact time, task completion time and conversion rate. You'll become more organized: remember the old days when customer data resided in paper folders and filing cabinets? With CRM, you'll keep all your customer data organized and easy to access. You'll also be able to use a search function to quickly find whatever information you're looking for. You'll boost sales opportunities: using CRM, you can easily identify customer buying patterns and use this information to increase future sales opportunities. You can also more effectively launch new products since you'll know which customers are most likely to purchase those products. You'll enhance your social media marketing: social media sites like Facebook, Twitter, LinkedIn and Instagram offer a wealth of selling opportunities, but they can be challenging to monitor. Integrating CRM with your social media campaigns, you'll see which channels are generating the most traffic and monitor social conversations about your brand, your business and your products. You'll be able to customize software to your business needs: there are many CRM products on the market, each offering slightly different benefits. For example, some businesses might need only a contact management system, while others will need a shared database and sales tracking. You can easily find the CRM product which best suits your needs, purchasing only what you need. You'll be able to scale up as your business grows: your business isn't static and, if all goes as you hope, it will grow over time. You can easily upgrade your CRM software as your business grows and your needs change, especially if your CRM platform is cloud-based. 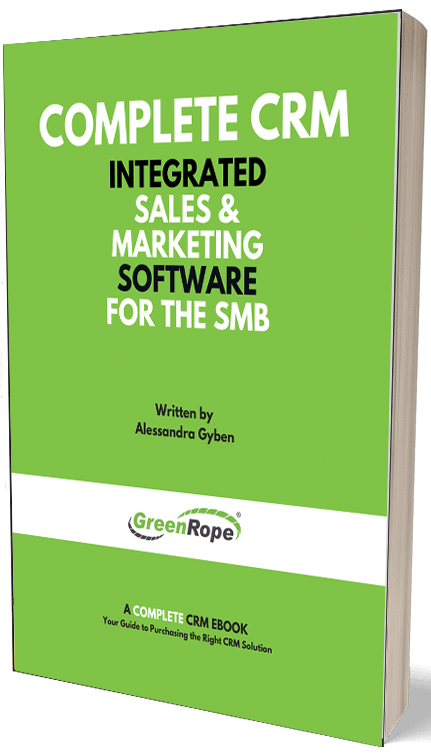 You'll be able to integrate CRM with existing platforms: you can find CRM software which seamlessly integrates with existing software, like QuickBooks or Microsoft Outlook. It's important that you ensure the CRM you choose is compatible with all existing platforms before you purchase it. You'll be able to integrate CRM with existing mobile technologies: if your business uses mobile technologies, you can find CRM software that you can access on smartphones and tablets. This is especially important for your sales agents, who typically need current data on the road. Theoretically, small businesses like yours can succeed without the use of CRM software, but why would you want to take the chance? When you find and install CRM software which has been customized for your business, your customer interactions will improve dramatically, increasing sales and driving both productivity and growth. To learn more about the ways our CRM and marketing automation platform will meet the needs of your sales, marketing and operations departments to boost sales and grow your business, contact us today.